As time passes and we grow older, our skin starts to suffer. What start off as expression lines, only visible when smiling, become deep set wrinkles over time. As well as our skin, the pigment of our hair will start to decline over the years leading to coarse grey hairs that become increasingly hard to manage. Both these issues can be signs of premature ageing and are more prevalent in smokers and heavy drinkers, although growing old is something none of us can avoid. Apple cider vinegar is a natural elixir that has been used in traditional medicine for thousands of years. This raw, fermented liquid possessed a myriad of formidable anti-ageing properties in the form of enzymes, natural acids, trace minerals, vitamins and more. Although many people grumble at the somewhat tart taste of ACV, there is no disputing that this versatile remedy can reinvigorate your body and even help to roll back the visible signs of ageing. Skin pH - Our skin is meant to stay slightly acidic at a pH of around 5.5. However, many soaps and body washes remove naturally occurring acids from our skin leaving it in an alkaline state. This can lead to dry, flaky patches and increase visible wrinkles. Simply adding a cup of raw apple cider vinegar to your bath water is a great way to combat this problem. Antioxidants - Our skin and hair, like all parts of our body, suffer from damage caused by oxidative stress. Free radicals are reactive molecules that are highly charged due to one or more unpaired electrons. They scavenge your body to grab or donate electrons, thereby damaging cells, proteins, and DNA (genetic material). Luckily, apple cider vinegar contains a powerful antioxidant substance known a beta-carotene. This is able to offer up the needed electron rendering the free radical harmless. Vitamins & Minerals - If you have purchased commercial anti-ageing cosmetics in the past you will be aware of the star role that vitamins and minerals play within these products. Apple cider vinegar is a natural source of pectin, vitamins B1, B2, and B6, biotin, Folic acid, niacin, Pantothenic acid and vitamin C. In addition to these vitamins, a selection of trace minerals can be found in apple cider vinegar including sodium, phosphorous, potassium, calcium, iron and magnesium. The first thing to do when making our raw ACV health tonic is warm some water in a pan. The next step is to mix in some honey. Raw or Manuka honey is best, although Agave and Blackstrap molasses also work well. Once our water and honey is combined, add the mixture to an eight ounce glass, being sure to leave room for the apple cider vinegar. Around two or three tablespoons of vinegar is all that is needed to complete this drink. Drink this every morning before breakfast for maximum benefits. The first step is to dilute your apple cider vinegar down to a 50 - 50 mixture with cooled green tea. Once mixed with the green tea, it is time to add some essential oils. Tea tree and lemon oil both work great. Decant your mixture into a plastic spray bottle as this can be stored in the fridge for up to two weeks. Use this to rinse your face twice a day in place of your regular facial toner. 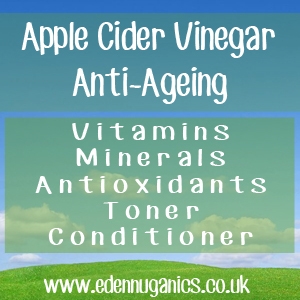 Apple Cider Vinegar Anti-Ageing Natural Toner! In 1912, Dr Alexsis Carrel, a scientist in New York, began an experiment that would last for 35 years. By the daily monitoring of nutrition and constant cleansing, Alexsis was able to keep the cells of a chicken heart alive for 35 years. A Chicken's normal lifespan is around 7 years, making this a remarkable achievement. After completing the experiment Alexsis came to the conclusion that "The cell is immortal. It is merely the fluid in which it floats that degenerates. Renew this fluid at intervals, give the cells what they require for nutrition and as far as we know the pulsation of life may go on forever." And yes you guessed it. One of the substances used daily to keep the heart cells alive was apple cider vinegar due to its high levels of easily absorbed potassium.